Berlin is the capital, the most populous and largest city of Germany. The city of Berlin is also one of Germany's sixteen federal states. It covers an area of 891.8 km² and has a population of about 3.4 million (2005). Cölln on the Spree island was first mentioned in a document of 1237. The earliest written mention of Berlin, located on the northern bank of the Spree river, is found in a document of 1244. Both towns received a common town hall in 1307. Contrary to popular belief, and although the city crest shows a bear, the name Berlin is not derived from the name of the animal ('Bär' in German), but most likely is derived from the Slavic syllable 'berl', which refers to a swampy area. In 1415 Friedrich I became Elector of Brandenburg. In 1451 Berlin was chosen as the official residence town and lost its status as a member of the Hanse federation of trading towns. Members of the House of Hohenzollern resided in Berlin until 1918, at first as margraves and electors of Brandenburg, since 1701 as Kings in Prussia (the title was changed to Kings of Prussia by Friedrich II), and from 1871 until 1918 as German emperors. In 1710 the cities of Berlin, Cölln, Friedrichswerder, Dorotheenstadt and Friedrichstadt were combined into the new royal residence and capital city of Berlin. In 1861 Wedding, Moabit, and the suburbs towards Tempelhof, Schöneberg, Spandau and other areas were incorporated into Berlin. In 1871 the city became the capital of the newly founded German Empire. The Greater Berlin Act (Groß-Berlin-Gesetz) of 1920 increased the geographical area of Berlin from 66 to 883 km² by the incorporation of the formerly independent cities of Lichtenberg, Schöneberg, Wilmersdorf, Charlottenburg, Neukölln, Cöpenick and Spandau, and further 59 rural communities and 27 estate areas. After World War II, Berlin was divided into 4 zones controlled by the Allied forces (see map). While the Federal Repubilc of Germany moved its capital to Bonn, the German Democratic Republic chose (East) Berlin as its capital. The infamous Berlin Wall was erected by East Germany in 1961. Almost thirty years later, in 1989 the Wall came down under pressure of the East German people. The following year saw the re-unification of Germany. In 1991, the Bundestag, the first chamber of the German parliament decided, after much debate, to move the capital of the state back to Berlin. Parliament and government were able to begin their workin the new capital in 1999. (West-)Berlin was selected to be European City of Culture for 1988 by the Council of the European Union. The Stadtschloss (Berlin City Palace) originally was the winter residence, later the main residence of the Margraves and Electors of Brandenburg, later Kings in/of Prussia, and finally, after 1871, the German Emperors. The original castle on the Spree Island was founded in 1443 by Elector Friedrich II ('the Iron' or 'Irontooth'). In the 16th century it was replaced by a splendid renaissance residence under Electors Joachim II and Johann Georg. After the Thirty Years' War the palace had to be restored under Friedrich Wilhelm, the 'Great Elector'. Elector Friedrich III (Friedrich I as King in Prussia since 1701) commissioned Andreas Schlüter and later Johann Friedrich Eosander to enlarge the residence in splendid Baroque style. Not all plans were carried out, the building was completed under the more austere Friedrich Wilhelm I. ('the Soldier King'). The characteristic cupola after a design by Karl Friedrich Schinkel was added by Friedrich August Stüler und Albert Dietrich Schadow. The palace was severely damaged on 3 February 1945 and burned out. The exterior and supporting walls and staircases survived, making the ruins a veritable sight. Between 1945 and 1950 some parts were restored. Although it would have been feasible to restore the City Palace, the Communist government of East Germany decided that the palace was a symbol of Prussian absolutism and therefore ordered its demolision. In its place, the "Palast der Republic" was erected in 1973–1976. Gate no. IV of the old palace was preserved and integrated into the Staatsratsgebäude on the southern end of the square, because Karl Liebknecht on 9 November 1918 had proclaimed the Socialist Republic from its balcony. The Kurfürstenbrücke ('Electors' Bridge) [left, no. 2533: foreground right; and below, no. 3489: top picture] was built in 1895 replacing the Lange Brücke, which had been built in 1684. The bridge was severely damaged at the end of World War II, only the middle arch had survived the battles. Immediately after the war, a wooden temporary bridge allowed the crossing of the Spree river. The wooden construction was replaced by a steel bridge in 1947/1949. In 1951 the bridge was officially renamed Rathausbrücke. When this bridge proved to be not strong enough for the contemporary trafic, it was replaced by yet another steel and concrete bridge, which itself was replaced by a new construction in 1974Кз. Since then, the bridge was open only to pedestrians and bicycles. In June 2009 the bridge was dismantled and will be replaced by a new construction. The equestrian monument for Elector Friedrich Wilhelm I [left, no. 2533: center left] was unveiled in 1703. It was created by the architect an sculptor Andreas Schlüter. During World War II, the equestrian statue was removed to protect it from air raids. After the war it was found in the Tegeler See. It was then re-erected in front of Charlottenburg Palace. the Pariser Platz with the Brandenburg Gate (see below). The Konzerthaus Berlin [left, no. 3489] was built in 1818–1821 as the new 'Royal Theatre' (Königliches Schauspielhaus) by the architect Karl Friedrich Schinkel. During the 1848 Revolution its main auditorium housed the Prussian National Assembly for several weeks in September, with the Gendarmenmarkt a major arena of political events. After World War I it was renamed Preußisches Staatstheater (Prussian State Theatre). Severely damaged during World War II by Allied bombing and the Battle of Berlin the building was rebuilt from 1977 onwards and reopened as the concert hall of the Berlin Symphony Orchestra in 1984. The exterior, including many of the sculptures of composers by Christian Friedrich Tieck and Balthasar Jacob Rathgeber, is a faithful reconstruction of Schinkel's designs, while the interior was adapted in a Neoclassical style meeting the conditions of the altered use. In 1994 the venue was renamed the Konzerthaus Berlin. The Kaiser-Wilhelm-Brücke [right, no. 1793: foreground] was built in 1886–1889 in place of the older Kavalierbrücke which had been built in the 1830s. The bridge was dismantled in 1939 by the Nazis who planned a new east-west axis through Berlin. The bronze statues of bears which originally had ornated the obelisks of the bridge, were brought to Hesse for being smelted down. However, the statues were saved and were sold to the USA after the war. A wooden temporary bridge allowed the crossing of the Spree river until 1944. A new bridge was built in 1949 and was named Karl-Liebknecht-Brücke. After the fall of the Berlin Wall in 1989 the bridge was renovated, and the bronze bears were repurchased from the American owners. They were unveiled on the new bridge in 1997. The Protestant Berlin Cathedral (Berliner Dom) was built in 1894–1905 on the Spree Island facing the Lustgarten and the Berlin City Palace. The first church was built on the site in 1465 as the court chapel for the Hohenzollern family. A Baroque cathedral by Johann Boumann was completed in 1747 and later remodelled in the Classicist style in 1822 by Karl Friedrich Schinkel. Since that church did not meet the representational needs of the court any more, it was demolished in 1894 and replaced by the current Cathedral designed by Julius Raschdorff. With its dimensions (114 m long, 73 m wide and 116 m tall) it was much larger than any of the previous buildings and was considered a Protestant counterweight to the St. Peter's Basilica in Rome. During the Second World War, the building was bombed by the Allies and severely damaged. A temporary roof was installed to protect what remained of the interior and in 1975 reconstruction started. The restoration of the interior was begun in 1984 and in 1993 the church reopened. During reconstruction, the original design was modified into a more simple form. The Alte Nationalgalerie (Old National Galery) [left, no. 1685: background] is located on the Museum Island in the river Spree. The museum was designed in 1865 by Friedrich August Stüler after a sketch drawn by King Friedrich Wilhelm IV of Prussia. The plans were executed in 1869–1876 under the supervision of Heinrich Strack. The building in the form of a Roman temple was severely damaged in World War II. The museum was re-opened already in 1949, but the restoration works continued until 1969. A new, thorough restoration was carried out in 1998–2001. The museum houses the most important works of the 19th century from the collection of the Stiftung Preußischer Kulturbesitz (Foundation Prussian Cultural Heritage). The bridge Friedrichbrücke [foreground] across the Spree river was built in 1769 and was named for King Friedrich II. Only the four flanking obelisks have remained from that original structure. In 1982 the historic bridge was replaced by a modern prestressed concrete construction. The Kaiser-Friedrich-Museum, today called Bode-Museum, [right, no. 3508: bottom left picture] is located on the northwestern end of the Museum Island. It was designed by architect Ernst von Ihne and completed in 1904. Originally called the Kaiser-Friedrich-Museum after Emperor Friedrich III, the museum was renamed in honour of its first curator, Wilhelm von Bode, in 1956. Closed for repairs since 1997, the museum was reopened in 2006 after a €156 million refurbishment. True to the ethos of its founding director, Wilhelm von Bode, who believed in mixing art collections, it is now the home for a collection of sculptures, Byzantine art, and coins and medals. The Museum Island and its museums were listed as a UNESCO World Heritage site in 1999 (see also list of other UNESCO heritage sites). The equestrian monument for Emperor Wilhelm I [left, no. 2953, and right, no. 2176] was situated in front of the western side of the Stadtschloss. After the death in 1888 of Wilhelm I, the first German emperor, a contest was held in 1889 for the creation of a national menument. It took a second, controversial, contest in 1891 to finally chose Reinhold Begas as designer for the monument. The surrounding collonade was created by the architect Gustav Friedrich Halmhuber. The bronze statue of the emperor had a height of 9 m, the total height of the monument was 21 m. In 1950 the government of the German Democratic Republic ordered the removal of the equestrian statue, only the pedestal remained. 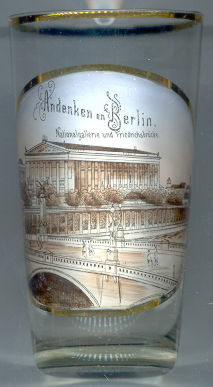 Several glasses of this collection show other monuments for Wilhelm I.
Unter den Linden ('Under the Lindens') [left, no. 1487: top picture], named for its Linden or lime trees which line the grassed pedestrian mall between the two carriageways, is one Berlin's most famous splendid boulevard. A boulevard of linden trees was planted from 1647 extending from the electoral palace to the gates of the city by Friedrich Wilhelm, "The Great Elector", who wanted to ride from his castle to his hunting park the Tiergarten with more Baroque splendor. The section west of the Brandenburg Gate, going through the Tiergarten Park, is called now Straße des 17. Juni, having previously been called Charlottenburger Straße. The equestrian monument for Friedrich II [left, no. 1487: bottom right picture] was created by Christian Daniel Rauch. The reliefs on the pedestal show 74 generals and philosphers. The founding stone as laid on 1 June 1840, the 100th anniversary of Friedrich's accession; the monument was finally completed in 1851. The bottom left picture on glass no. 1487 shows the cathedral (see above). The Humboldt University of Berlin [near left, no. 2608: top picture] founded in 1810 as the University of Berlin (Universität zu Berlin) by the liberal Prussian educational reformer and linguist Wilhelm von Humboldt, whose university model has strongly influenced other European and Western universities. From 1828 it was known as the Frederick William University (Friedrich-Wilhelms-Universität), later (unofficially) also as the Universität unter den Linden. In 1949, it changed its name to Humboldt-Universität in honour of both its founder Wilhelm and his brother, naturalist Alexander von Humboldt. Depicted on the glass is a view of the main building [near left, no. 2608: top picture] (originally Palais of Prince Heinrich of Prussia), which is located in the centre of Berlin at the boulevard Unter den Linden. The building was erected in 1748/1749 on order by King Friedrich II for his younger brother Prince Heinrich of Prussia. The plans for the building in late Baroque style were drawn by Johann Boumann who may have used early designs by Georg Wenzeslaus von Knobelsdorff for a royal residence as part of a planned 'Forum Fridericianum'. The Seven Years' War caused an interruption of the construction works, and the building was finally completed in 1766. On the foundation of the university in 1809, King Friedrich Wilhelm III donated the palais to the university. The building was modified in 1836–1846 and 1892, further enlargements were added in 1913–1920. During World War II large parts of the university building were destroyed. The central wing was rebuilt between 1947 and 1954, the eastern wing followed between 1958 and 1962. In 1975 the building was listed as a historical monument. The bottom picture on glass no. 2608 shows another view of the cathedral (see above). The Zeughaus (old arsenal) [right] is the oldest structure on the boulevard Unter den Linden. It was erected between 1695 and 1706 Baroque style, to be used as an artillery arsenal. It was built to the plans of Johann Arnold Nering; after his death, Jean de Bodt and Andreas Schlüter supervised the works. The building was transformed into a military museum in 1875. From 1949–1965 the Zeughaus was restored after heavy war damage, the interior being completely redesigned. Today the Zeughaus is the site of the German Historical Museum (Deutsches Historisches Museum). The Brandenburger Tor (Brandenburg Gate) [left] is the symbol of Berlin. Located on the Pariser Platz, it is the only remaining one of the series of gates through which one once entered Berlin. It constitutes the monumental termination of Unter den Linden, the renowned boulevard of linden trees which led directly to the royal residence. The gate, commissioned by Friedrich Wilhelm II as a sign of peace, was built by Carl Gotthard Langhans in 1788–1791 in early Classicist style. The design of the gate was based on the Propylea, the gateway to the Acropolis in Athens, Greece. It consists of twelve Greek Doric columns, six on each side. This allows for five roadways, although originally ordinary citizens were only allowed to use the outer two. Above the gate is the Quadriga, consisting of the goddess of peace, driving a four-horse chariot in triumph. The gate stands 26 m high, 65.5 m wide and 11 m thick. While the main design of the Brandenburg Gate has remained the same since it was completed, the gate has played varying roles in Germany's history. First, Napoleon took the Quadriga to Paris in 1806 after conquering Berlin. When it returned to Berlin in 1814, the statue exchanged her olive wreath for the Iron Cross and became the goddess of victory. When the Nazis rose to power, they used the gate to symbolize their power. The only structure left standing in the ruins of Pariser Platz in 1945, apart from the ruined Academy of Fine Arts, the gate was restored in 1956/1957 by the East Berlin and West Berlin governments. However, in 1961, the gate was closed when the Berlin Wall was built. When the Berlin Wall fell in 1989, the gate symbolized freedom and the unity of the city. It re-opened on 22 December that year when the West German Chancellor Helmut Kohl walked through to be greeted by the East German Prime Minister, Hans Modrow. The Berlin Town Hall, also called Rotes Rathaus ('Red Town Hall') [right] in Rathausstraße is the seat of the city administration and of the mayor of Berlin. Its popular name is derived from the red clinker that was used for its façade. The town hall was built in 1861–1869 by the architect Hermann Friedrich Wäsemann. The design of the tower (74 m high) was based on that of the towers of the cathedral of Laon in France. After World War II it was home of the municipal administration for East Berlin, while that of West Berlin took its seat in the Schöneberg Town Hall. Since 1991 it is again the seat of the administartion for the re-unified city of Berlin. Glass no. 3489 [left] shows the City Palace [top picture], the Brandenburg Gate [bottom right picture] and the Schauspielhaus am Gendarmenmarkt (today Konzerthaus Berlin) [bottom left picture]. The Schauspielhaus am Gendarmenmarkt (Konzerthaus Berlin) [bottom left picture] is situated on Gendarmenmarkt square, today housing the Konzerthausorchester Berlin. Built as a theatre from 1818 to 1821 under the name Schauspielhaus Berlin, later also known as Theater am Gendarmenmarkt and Komödie, its usage changed to a concert hall after World War&nnbsp;II and its name changed to its present one, Konzerthaus Berlin, in 1994. The building's predecessor, the National-Theater in the Friedrichstadt suburb, was destroyed by fire in 1817. The new hall was designed by Karl Friedrich Schinkel between 1818 and 1821. The new Königliches Schauspielhaus was inaugurated on June 18, 1821. After World War I it reopened under the name of Preußisches Staatstheater Berlin in October 1919. Severely damaged during World War II by Allied bombing and the Battle of Berlin, the building was rebuilt from 1977 onwards and reopened as the concert hall of the Berliner Sinfonie-Orchester in 1984. Glass no. 1850 [left] shows the City Palace [top picture], the Brandenburg Gate [bottom right picture] and the bridge Jannowitzbrücke [bottom left picture]. The Jannowitzbrücke [left, no. 1850: bottom left picture] across the river Spree was originally built in 1822. In 1835 the bridge was named for cotton factory owner August Alexander Jannowitz who had founded an association for raising the money for the construction. A new bridge was constructed in 1881–1883. This bridge is depicted on the glass. The bridge was demolished when the metropolitan railway was built. In its place a third bridge was built and was opened, together with the metro station Jannowitzbrücke in 1930. Towards the end of World War II it was blown up. The remains were removed only in 1950/1951. The present bridge was constructed in 1952–1954. Glass no. 1967 [right] shows the street Unter den Linden [top picture], the Potsdamer Bahnhof [bottom left picture] and the bridge Potsdamer Brücke [bottom right picture]. The Potsdamer Bahnhof [right no. 1967: bottom left picture] was thr first railway station in Berlin, opening in 1838 and linking Berlin to Potsdam. It was located at Potsdamer Platz, about 1 km south of the Brandenburg Gate, and kick-started the transformation of Potsdamer Platz from an area of quiet villas near the south-east corner of the Tiergarten into the bustling focal point that it eventually became. For more than a century it was the terminus for long-distance and suburban trains. The first Potsdamer Bahnhof lasted until 1869, when it was superseded by a far grander structure in response to growing traffic. Opened on 30 August 1872, it eventually handled train services to and from Cologne, Paris, Frankfurt am Main, Strasbourg and Aix en Provence. By 1890 over 3 million people a year were using it, and it was holding its own against a larger rival down the road (the Anhalter Bahnhof). Still the facilities could not cope, and so in 1890–1891 two additional termini were built on either side of it for short-haul and suburban traffic: the Ringbahnhof on the eastern side and the Wannseebahnhof on the western side. The main façade shown on glass no. 1967 [right] dates from that period. During World War II the terminus, like most of Berlin, was devastated by British and American bombs and Soviet artillery shells. Despite some rubble clearance and emergency repairs, it and the Ringbahnhof finally closed in 1944. Shortly after war's end the Ringbahnhof got a reprieve of sorts, temporarily reopening as terminus of the Wannseebahn trains, but closing for good in 1946. ALthough the West-Berlin districts of Kreuzberg and Tiergarten lay on either side of it, the station and adjacent tracks remained part of the Soviet occupation zone. Above ground the remains of the terminus were cleared away in stages between 1957 and 1960. The Potsdamer Brücke [right no. 1967: bottom right picture] across the Landwehr canal was built in 1898. The bridge was destroyed in 1944. Tiergarten was a separate city borough of Berlin until 2001 when it was amalgamated with the boroughs Wedding and Mitte. The Reichstag [left] is the seat of the German parliament. An initial architectural contest with 103 participating architects was carried out in 1872, but due to problems with purchasing property for the new building and arguments between Emperor Wilhelm I, chancellor Otto von Bismarck, and the members of the Reichstag did not start until some ten years later. A second contest was held in 1882 with 189 architects participating. The winner of this contest was Paul Wallot from Frankfurt. The construction started in 1884 and was completed in 1894. The original building was most acclaimed for the construction of an original cupola of steel and glass, a technical masterpiece of the time. The building was home of the Reichstag until 1933. After Adolf Hitler had been appointed Reichskanzler on January 30, 1933, the building was set on fire on February 27, 1933, under circumstances not yet entirely clear. This proved to be a valuable excuse for the Nazis to suspend most Human Rights provided for by the 1919 constitution in the Reichstag Fire Decree. During the Nazi period the building was not used for parliamentary purposes at all. In 1945 the building was severely damaged. Since there was no real use for the building after the war, it was left in ruins. In 1956, after some debate, it was decided that the Reichstag should not be taken down, but instead be restored. Unfortunately, the cupola of the original building, which had also been heavily damaged in the war, was demolished. Another architectual contest was held, and the winner, Paul Gotthilf Reinhold Baumgarten, reconstructed the building in 1961–1964. Until 1990, the building was used only for occasional representative meetings and for a widely lauded permanent exhibition about German history called "Fragen an die deutsche Geschichte" ('Questions to German History'). The official German reunification ceremony on October 3, 1990, was held at the Reichstag building, including President Richard von Weizsäcker, Chancellor Helmut Kohl, former Chancellor Willy Brandt and many others. On June 20, 1991, the Bundestag, the parliament of the Federal Republic of Germany, concluded with a quite slim majority that both government and parliament should return to Berlin from Bonn. In 1992, Norman Foster won yet another architectual contest for the reconstruction of the building. His winning concept, however, looked very different from what was actually later executed. Before reconstruction began, the Reichstag was wrapped by the Bulgarian artist Christo in 1995, attracting millions of visitors. The new glass and steel cupola is now one of the most visited attractions of Berlin. The first official use of the new Reichstag building was the election in 1999 of the new German president, Johannes Rau, by the Bundesversammlung ('Federal Assembly'), the combined assembly of Reichstag and Bundestag, the two chambers of the German parliament. 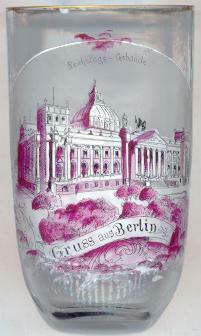 The Reichstag is also depicted on glass no. 091 [right: bottom right picture]. The monument for Otto von Bismarck in front of the Reichstag [barely visible] was created by Reinhold Begas, although originally another project had won the competition for the monument. The monument was unveiled on 16 June 1901 on Königsplatz (today Platz der Republik) in front of the Reichstag building. In 1939 the monument was moved to its present location at the northern corner of the Großer Stern. It is one of Berlin's largest monuments (total height 15 m, length 20 m, width 12 m). The Siegessäule (Victory Column) is one of Berlin's most famous sights. Designed by Heinrich Strack after 1864 to commemorate the victory of Prussia in the Danish-Prussian war, by the time it was inaugurated on 2 eptember 1873 Prussia had also defeated Austria in the Austro-Prussian War and France in the Franco-Prussian War (1870/1871), giving the statue a new purpose. Different from the original plans, these later victories inspired the addition of the bronze sculpture of Victoria, 8.3 m high and weighing 35 tonnes, designed by Friedrich Drake. Berliners, with their fondness for disrespectful names of famous buildings, call the statue "Goldelse", meaning something like "Golden Lizzy". Anchored on a solid fundament of polished red granite, the column sits on a hall of pillars with a glass mosaic designed by Anton von Werner. The column itself consists of three solid blocks of sandstone, which are decorated by cannon pipes captured from the enemies of the aforementioned three wars. A relief decoration on the foundation, which had to be removed on request of the victorious allied forces in 1945, was restored in the 1980s. Originally the column was erected with a height of 50.7 m opposite the Reichstag building. 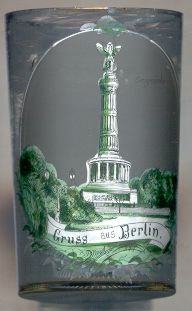 In preparation of executing the monumental plans to redesign Berlin, the Nazis in 1939 relocated the pillar to its present location at the Großer Stern (Great Star), a large intersection on the visual city axis that leads from the former Berlin City Palace through the Brandenburg Gate to the western parts of Berlin. At the same time, the pillar was augmented by another 7.5 meters, giving it its present height of 66.9 (including the statue).The monument survived World War II without much damage. The relocation of the monument probably saved it from destruction, as its old site in front of the Reichstag was completely destroyed in the war. Charlottenburg is located between the rivers Havel and Spree east of the city centre of Berlin and is part of the city borough Charlottenburg-Wilmersdorf. The borough of Charlottenburg-Wilmersdorf covers an area of 64.7 km² and has a population of about 315,100 (2004). The history of Charlottenburg goes back to the village of Lietzenburg (originally Lietzow, first mentioned in 1239). The city of Charlottenburg was founded in 1706 and was named after Charlottenburg castle. In the 18th century Charlottenburg became a favourite recreation area for the citizens of Berlin. 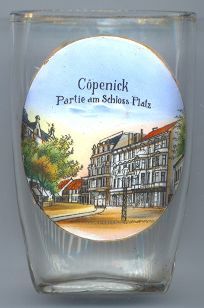 In the 19th century it became a fashionable residential area and finally was the richest city in Prussia. In 1877 Charlottenburg obtained the status of a city that is administered as a district in its own right. On 1 October 1920, Charlottenburg became the 7th city borough of Groß-Berlin (Greater Berlin). On 1 January 2001, the borough of Charlottenburg was amalgamated with the borough of Wilmersdorf. Charlottenburg castle [left, no. 1872, and right, no. 3130: top picture] was built in 1695–1699 in Italian Baroque style by the architect Johann Arnold Nering for Sophie Charlotte, consort of Elector Friedrich III of Brandenburg. At that time the castle was still named Lietzenburg castle. When Friedrich III in 1701 was crowned King in Prussia (Friedrich I), the castle was enlarged to become a splendid residence. When Queen Sophie Charlotte died in 1705, the King renamed the castle and the village Charlottenburg. The characteristic tower and the orangerie were added in 1709–1712. Charlottenburg castle was the original location of the world-famous Amber Room. Soon after its creation in 1701–1709 King Friedrich Wilhelm I in 1716 gave it to Czar Peter the Great who installed in the Winter Palace of Sankt Peterburg. Further important extensions of Charlottenburg castle were made by the architect Georg Wenzeslaus von Knobelsdorff for King Friedrich II. However, in 1747 the king moved his favourite seat of residence to Sanssouci palace in Potsdam. The final additions to the castle, the castle theatre and the small orangerie, were finally added by Carl Gotthard Langhans for King Friedrich Wilhelm II. In 1888, Charlottenburg castle was the residence of the tragic Emperor Friedrich III who ruled only for 99 days. The castle was severely damaged in 1945 but was restored after the war. The monumental Charlottenburg Town Hall [left, no. 1701, and above right, no. 3130:bottom left picture] was built in 1899–1905. An extension, which was already part of the original plans, was realised in 1911–1916. The height of the tower of the town hall is 88 m which is higher than the height of the dome of Charlottenburg castle. It is said that Emperor Wilhelm II from then on always took a detour when going to the castle in order to avoid passing the civil town hall. The building was severely damaged in World War II and was restored in 1947–1952. The Kaiser-Wilhelm-Gedächtniskirche (Kaiser Wilhelm Memorial Church) [left] is located on the Kurfürstendamm in the centre of the Breitscheidplatz. Emperor Wilhelm II decided to name the church in honor of his grandfather Emperor Wilhelm I. The foundation stone was laid on March 22, 1891, which was Wilhelm I's birthday. The competition for the design was won by Franz Schwechten who planned for a large church to be built in Romanesque Revival style, including 2,740 square meters of wall mosaic. The spire was 113 meters high and the nave seated over 2,000 people. The church was consecrated on 1 September 1895. By this time of the consecration the entrance hall in the lower section had not been completed. This was opened and consecrated on February 22, 1906. In World War II, on the night of 23 November 1943, the church was irreparably damaged in an air raid. The church was largely destroyed but part of the spire and much of the entrance hall survived. The present, new church was designed by Egon Eiermann and consists of four buildings grouped around the remaining ruins of the old church. The initial design included the demolition of the spire of the old church but following pressure from the public, it was decided to incorporate it into the new design. The four buildings comprise, on the west of the ruins, the new church with a foyer to its west, and to the east of the ruins, a tower with a chapel to its northeast. The plan of the church is octagonal while the plan of the tower is hexagonal. These components are sited on a plateau measuring 100 metres long and 40 metres wide. The new buildings are constructed of concrete, steel and glass. The walls of the church are made of a concrete honeycomb containing 21,292 stained glass inlays. The church is 35 metres in diameter and 20.5 metres high with a capacity of over 1,000. Because of the distinctive appearance of the new buildings, it is sometimes nicknamed "Lippenstift und Puderdose" ('the lipstick and the powder box') by Berliners. Berlin's borough Kreuzberg was founded in 1920. Originally it was named Hallesches Tor. The name Kreuzberg is derived from a monument, in the form of the Iron Cross, which had been erected on the hill Tempelhofer Berg in 1821 by Karl Friedrich Schinkel remembering the liberation wars against Napoleon. On 1 January 2001 Kreuzberg was combined with Friedrichshain to form the new borough of Friedrichshain-Kreuzberg. Since these two boroughs are linked only by a single bridge over the Spree river, the Oberbaumbrücke, this combination seemed awkward to many residents. 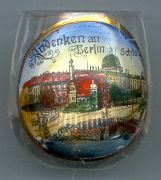 The two boroughs also could not agree on a common location for the future borough's city hall, so the present location in Friedrichshain was decided by throwing a five-Mark coin. the square Hallesches Tor is located on the site of a former gate of Berlin's toll wall which in the 18th century had replaced the former fortification. The gate in the southeastern section of the wall opened to the road towards Halle, the main city of the Prussian province Saxony. The station of the elevated railway, part of the Berlin metropolitan railway, was opened in 1902. The design in Renaissance Revival style was created by Hermann Solf and Franz Wichards. In 1922/1923 the station was extended by a connection with the North-South railway line. A further extension followed in 1935. After World War a provisional, wooden station building was erected, the reconstructed elevated station was opened in 1949. Neukölln is the eigth administrative city borough of Berlin, located in the south of the capital city between Tempelhof-Schöneberg to the west, Treptow-Köpenick to the east and Friedrichshain-Kreuzberg to the north. The borough of Neukölln covers an area of 44.9 km² and has a population of about 306,700 (2007). The city borough is named after the former independent town of Neukölln which is located in the northern part of the borough. The earliest written mention of Richardsdorp in a document dates from 1360; later documents mention the name as Ricksdorf, Riecksdorf and finally Rixdorf. The village at first was owned by the Order of St. John in Jerusalem who took over the village from the Knights Templar who at the time resided in Tempelhof. In 1737 Friedrich Wilhelm I, King in Prussia and Margrave of Brandenburg, permitted Protestant exiles from Bohemia to settle down in Rieksdorf. The Bohemians founded their own settlement, which from 1797 had its own administration under the name Böhmisch-Rixdorf. When two communities were merged in 1874, Rixdorf had already a population of about 8,000. Rixdorf was the largest village in Prussia until 1st May 1899 when it became an independent city district. In 1912 Rixdorf was renamed Neukölln. The reason for renaming the town was that the name Rixdorf had become notorious for criminality and "loose morals". Eight years later, on 1st October 1920, Neukölln was incorporated into Berlin following the Greater Berlin Act. Together with the villages of Britz, Rudow and Buckow it formed the 14th administrative district of Greater Berlin. Since the end of the 20th century there are some ambitions of renaming the district Neukölln back to the original name, Rixdorf. once for distinguishing it from the greater city borough of Neukölln, of which it is part, and secondly because of the greater memorability of the historical name. The top picture on glass no. 2444 [left] shows a view of Hohenzollernplatz with the monument for Emperor Wilhelm I. The equestrian monument was created in 1902 by the sculptor Albert Moritz Wolff. The bronze monument was melted down in 1944. The building depicted on the bottom left picture is labeled Königl. Polizei-Direktion (Royal Police Directorate), at the corner of Sonnenallee and Wildenbruchstraße. The directorate was opened on 28th September 1902. The building is listed as an architectural monument. Today it serves as the office of Abschnitt 54 (section 54: Neukölln) of the Polizeidirektion 5 which covers the two city boroughs of Friedrichshain-Kreuzberg and Neukölln. The third picture on the bottom right shows a view of the Protestant Genezareth-Kirche, located in Herrfurthplatz. The church was built in 1903–1905 after a Historicist Gothic Revival design by Franz Heinrich Schwechten who also designed the Gedächtniskirche and the Anhalter Bahnhof. The spire originally had a height of 62 metres. In 1939/1940 the upper part of the spire (above 38 m) was removed because it impeded the air traffic of the airfield at Tempelhof. The church was destroyed during a bomb-raid in 1944. The church was rebuilt in 1955–1959. The present church tower has a height of 22 metres. Spandau is situated mostly on the west bank of the river Havel in the west of the city of Berlin. The city borough of Spandau covers an area of 91.9 km² and has a population of about 225,700 (2004). Archaeological finds date the first traces of human settlements back to the 6th century when this area was inhabited by Slavic tribes. The castle Spandow, presumably a foundation of Margrave Albrecht 'the Bear' of Brandenburg, was first mentioned in 1197. The village was chartered as a town in 1232. The modern spelling Spandau was introduced only in 1878. In the 19th century, Spandau became a centre of the German weapons industry. On 1 October 1920, Spandau became the 5th city borough of Groß-Berlin (Greater Berlin). After World war II, Spandau belonged to the British zone of Berlin, with the exception of West-Staaken which was separated from Spandau and became part of the Soviet zone. After the re-unification of Germany in 1990 West-Staaken was again incorporated into the city borough of Spandau. From 1947, the Spandau Prison was used for the imprisonment of Nazi war criminals who were convicted at the Nuremberg trials. After the death in 1987 of the last and most famous inmate, Rudolf Heß, the prison was closed and demolished. The church Sankt Nikolai [left, no. 1783: picture, right] was built in the 14th century in Gothic style in place of an older church that had been first mentioned in 1240. In 1240 the citizens of Spandau had refused to take over the patronage of the church and thus the patronage, which included the right to choose the parish priest, remained with the Benedictine nunnery of Spandau until the time of the Reformation. The present church was built from about 1370 until the end of the 14th century; the tower was added in 1467/1468. The church of St. Nicholas became the cenre of Protestantism after Elector Joachim II converted to the new faith in 1539. The top of the church tower was rebuilt in Baroque style in 1744. The Kaiser-Wilhelm-Turm [left, no. 1783: bottom left picture] on the Karlsberg hill was built in 1897–1898 . The architect was Franz Schwechten. The tower has a height of 55 m, 202 steps lead up to a platform that offers a splendid view over the area. The tower was conceived as a monument for Wilhelm I, King of Prussia and first German Emperor. Today, the tower is called Grunewaldturm. The Juliusturm [left, no. 1783: bottom right picture, and below, no. 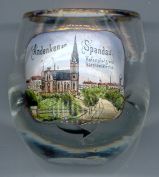 3564: top picture] is part of the Spandau Citadel. The citadel was built in 1559–1594 in place of a medieval stronghold northeast of the old town of Spandau, across the river Havel. The Juliusturm is the popular landmark of Spandau. The cylindrical tower has a height of 30 m. Its age is uncertain but the lower parts of the construction seem to date from the 13th century. The diameter of the walls is 3.60 m at the base and 2.60 m at the top. The Romantic pinnacles were added by the architect Karl Friedrich Schinkel in 1838. The origin of the name is also uncertain. The name "Juliusturm" seems to have evolved around 1400. Before that, the name was "Judenturm". After the end of the French-German War of 1870/1871, the tower was used to store the "Reichskriegsschatz", the contribution payments that France was obliged to pay to the victorious Germany. One thousand two hundred cases filled with gold coins amounting to five milliard French Francs or 120 million Gold Marks were stored here. After World War I, the treasure was restituted to France in 1919. The Protestant Garnisonkirche (Garrison Church) [left, no. 2020] at Hafenplatz was built in 1886–1889 in Gothic Revival style by the architect Ernst August Roßteuscher. The church was destroyed in World War II. The ruins were removed in 1949. Köpenick is located at the confluence of the rivers Spree and Dahme in the southeast of Berlin and is part of the city borough of Treptow-Köpenick. The borough of Treptow-Köpenick covers an area of 168.4 km² and has a population of about 59,600 (2004). In the mid 12th century the island in the Spree river was the siet of a castle of the Slavic inhabitants of the area. The name Copnic ('place on the island') was first mentioned in a document of 1209. Köpenick castle was the site of the law suit for high treason that was initiated in 1734 by Friedrich Wilhelm I, King in Prussia, against his son, the later King Friedrich II (Friedrich the Great). On 1 October 1920, Cöpenick became the 16th city borough of Groß-Berlin. The modern spelling Köpenick was introduced in 1931. A sad part of Köpenick's history is the "Köpenicker Blutwoche" of June 1933, when almost five hundred opponents of the Nazis were arrested by the SA; ninety-one of them were murdered. On 1 January 2001, the borough of Köpenick was amalgamated with the borough of Treptow. 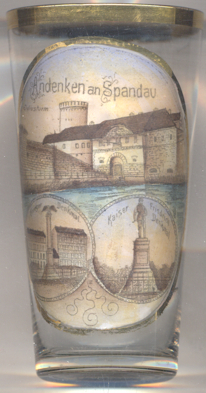 The best-know event in Köpenick's history is the "Cöpenickiade" of the shoemaker Hermann Voigt. Between 1864 and 1891, Voigt was sentenced to prison for a total of 25 years for thefts and forgery. The longest sentence was a conviction for 15 years for theft. He was released in 1906. Later that year he purchased parts of used captain's uniforms and tested their effect on soldiers. In Köpenick he went to the local army barracks, stopped four grenadiers and a sergeant on their way back to barracks and told them to come with him. Indoctrinated to obey officers without question, they followed. Then he took the soldiers to the Köpenick city hall, and told them to cover all exits. He had the town secretary and the mayor arrested for suspicions of crooked bookkeeping and confiscated 4000 marks and 70 pfennigs – with a receipt, of course. Then he commandeered two carriages and told the grenadiers to take the mayor and the treasurer to Berlin interrogation. He told the remaining guards stand in their places for half an hour and then left for the train station. In the train he changed to civilian clothes and slipped out. Voigt was arrested on October 26 and on December 1 sentenced to four years in prison for forgery, impersonating an officer and wrongful imprisonment. However, much of the public opinion was on his side. Emperor Wilhelm II pardoned him on August 16, 1908. There are some claims that even the emperor had been amused by the incident. Voigt later appeared in small theatres and toured in Dresden, Vienna and Budapest in variety shows, restaurants and amusement parks. In 1909, he published a book about his caper. Voigt died in 1922 in Luxembourg. In 1930 German author Carl Zuckmayer wrote a play about it named "Der Hauptmann von Köpenick" ('The Captain of Köpenick'), several movies were produced about the affair, among others with Heinz Rühmann in 1956, with Rudolf Platte in 1960 (TV) and Harald Juhnke in 1997. (Alt-)Treptow is situated south of the Landwehr canal in Berlin's city bourough of Treptow-Köpenick. The area was settled in the 6th or 7th century by Slavic tribes. The earliest mention of Trebow is found in a document of 1568. The official name in 1808 was Gutsbezirk (domain) Treptow. Most parts of the Cöllnische Heide woods were cleared in 1823–1840 and the area soon became a popular place for excursions. The rural community of Treptow was founded in 1876 after the first industrial establishments had moved to this place. In 1876/1877 Treptow Park was laid out after designs by the director of the Berlin municipal gardens, Gustav Meyer. In 1920 Treptow was incorporated into Groß-Berlin (Greater Berlin) and became a city borough. In 2001, the borough of Treptow was amalgamated with the borough of Köpenick. Glass no. 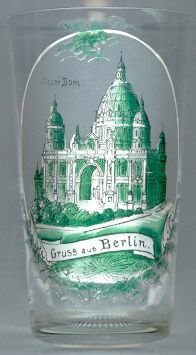 1349 is a souvenir from the Berliner Gewerbeausstellung (Industrial Exhibition of Berlin) which took place in Treptow Park in 1896. 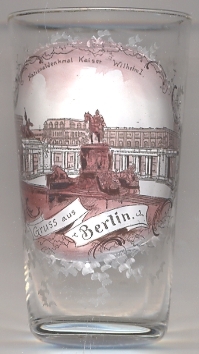 The exhibit "Alt-Berlin" depicted on the glass was was one of the most popular attractions of the exhibition. It consisted of replicas of scenes from 'Old Berlin'. The bottom right part of the picture depicts the exhibit "Theil des Alten Rathhauses" (old orthography, 'part of the old town hall'). The only structure from the exhibition which has remained today is the observatory. The telescope, constructed by the German astronomer Friedrich Simon Archenhold, is still the world's longest moving refracting telescope with a focal length of 21 m. The original wooden building was replaced by a new structure in 1908. Since 1946 it is named Archenhold-Sternwarte. 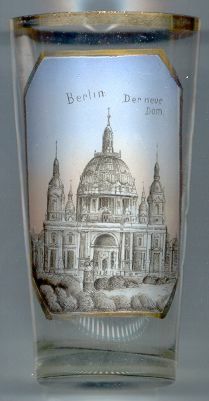 The inscription on the back of the glass reads "Heinrich Grimm von Oscar Arndt".